We spent a good amount of time with Intel at AUVSI Xponential 2018 in Denver. We learned a lot about the greater drone market, beyond the consumer machines we fly at home. The technology and challenges that Intel is working with represent the market as as whole. Most commercial drone vendors we chat with are working to overcome the same legal, environmental and big data needs. Jump passed the video for a brief overview, but grab some popcorn and be ready for a 20 minute interview if you want to learn it all. Another big thank you to Anil Nanduri, VP of Intel’s Drone Group, for taking the time to chat with us. As we witnessed at InterDrone 2017, Intel has been building a powerful software suite for drone inspection services. 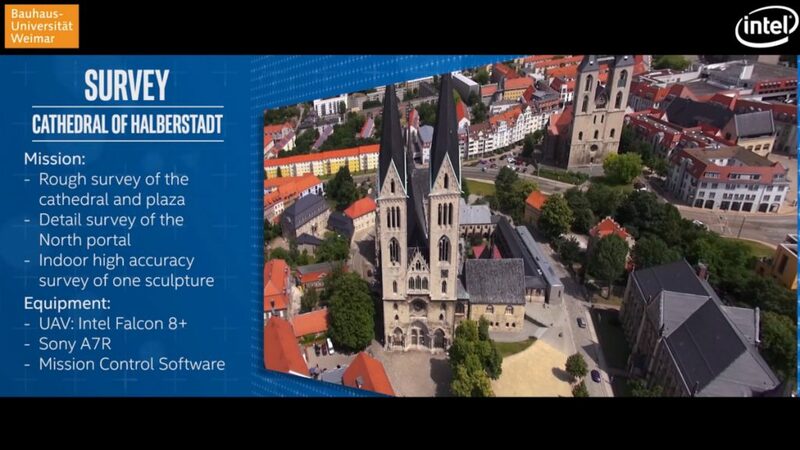 We’ve also heard of some projects putting it to work as well, like the cathedral in Germany. Insight is a program that thrives when supplied with repeat flight data. That is, choose your asset, be that a church, bridge or your house, allow the Falcon 8+ drone (or other drones, up to you) to fly around it and capture a repeatable set of images. At a later date, fly that exact same route, capture the exact same images and Insight will do half the work comparing the images. Insight is made to compare images over time. The software can identify changes, such as rust spots, missing pieces and more. It is not able to identify what the differences are, specifically, but it will alert you to look. View the asset from a large stitched together view, then drill down to see as much detail as your drone camera can provide. We’ll be hearing more about Insight down the road, it’s a powerful tool that is slowly opening up to the market. With eight propellers, safety and stability is the name of the game. Now with multiple payloads, choose from a selection of powerful Sony cameras and more for your aerial photography needs. 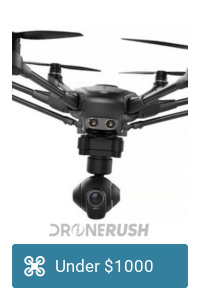 This is a fairly large and heavy drone, it is not made for flying in your backyard, but at the same time, it is safe to fly in your backyard. It employs the best of Intel’s RealSense technology for obstacle avoidance and autonomous flight. Side note: You may have seen RealSense on some Yuneec drones, like the Typhoon H. I can also tell you that representatives from Yuneec’s commercial team sat next to me at Intel’s Insight event, they looked interested in the RealSense info, but those are merely observations. The Falcon 8+ is still not a drone you can buy off the shelf. It can be found fro as low as $30,000, if you look around, but that is not Intel’s intent. Intel wants to sell you a service, they can handle every aspect of the drone and flight, then allow you to simply enjoy sitting back to analyze the data. 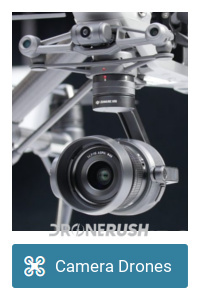 Ultimately, there is nothing new about the Falcon 8+ drone itself from AUVSI Xponential, just the new selection of cameras to choose from. These include up to 42 MP resolution, 4K shooters, FLIR infrared cameras and more for 2D and 3D image capture. Anil spoke little about the Shooting Star platform and drones during our interview. We’ll forgive him, there is little new to say, and this show truly was more about the commercial operations. The Shooting Star platform is coming off of its successful Olympics flights and is getting ready to ramp up its indoor flights with the Shooting Star Mini. They have a planned new World Record breaking event coming up in a few months, do stay tuned for that, we’ll do our best to bring you the details of the yet undisclosed event. Intel continues to prove that their entertainment business is extremely scale-able. 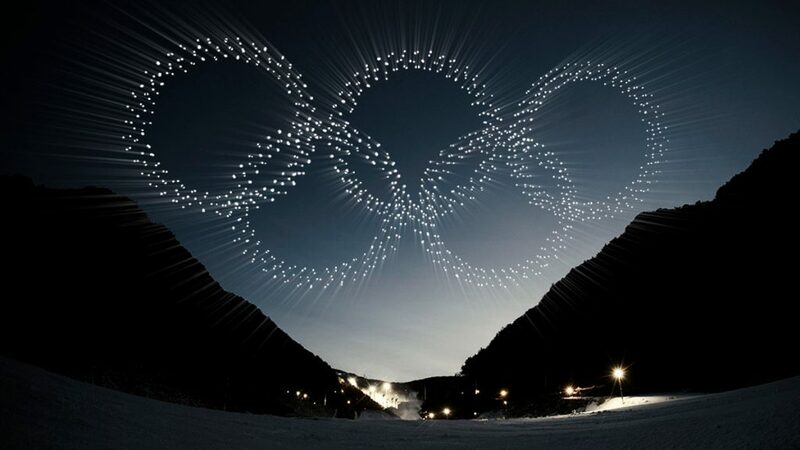 100 drones grew to 500 drones at the Super Bowl, over 1200 drones at the Olympics, and the next event should put over 1500 machines into the air. Bottom line, Intel has all but perfected their drone swarm technology. With that under control, the commercial side of things can adopt the systems to put multiple Falcon 8+ drones into the air, perfect for things like search and rescue operations. 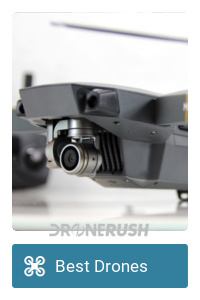 Do keep in mind that the FAA still says one drone per pilot. 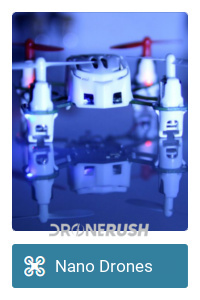 Intel works tirelessly to gain the waivers required to perform their multi-drone operations. This makes them ideal to hire for your commercial swarm needs, but does not guarantee results. As we mentioned in the intro to the Intel interview video above, we feel the company has a solid grasp on the challenges and technology of the current drone market. At AUVSI Xponential we met with a few military outfits and a couple retail manufacturers, they have different needs, but the commercial operators at the show were all facing the same obstacles and overcoming them in similar ways. Basically, aerial mapping, 3D mapping and continued consistent flights to capture images of the same asset over time are the future of drone inspection services. If you did not pick on it yet, software is key. The drones used for the operations are important, and very interesting to us, but the manufacturers are focused on the bits and bytes on the inside right now. With software as the focus, we can’t but assume that large amounts of data storage will be another obstacle to overcome. Intel says they can clock upwards of 18TB of data per day on a decent operation. I guess it’s time to buy some hard drives. There is no doubt that Intel is pushing hard on drones, at least as a part of greater data pursuits with technology.